Getty ImagesWill your retirement income last well into your golden years? As your retirement date approaches, it is natural to find yourself looking back at all that's happened over the course of your career, from personal and professional accomplishments to lessons learned and challenges overcome. As you look to the next phase of your life, you may realize that, despite all of those experiences, you have more questions than answers. What will your finances look like post-employment? Will your resources and personal savings last into and through retirement? Often, one spouse lives well into old age. What key decisions do you need to make now to ensure you are prepared to have decades of financial security in retirement? Here are a few tips to help you make informed decisions today so you can work to avoid retirement pitfalls tomorrow. 1. Identify your needs, wants and wishes. Make a plan to determine when, ideally, you would like to retire and, once you have retired, the type of lifestyle you would like to enjoy. This process will help you to develop a list of financial "needs," "wants" and "wishes" in retirement. Start with your "needs," which will include all day-to-day living expenses, such as housing, utilities, food, transportation and out-of-pocket medical expenses. Your "wants" will be "fun expenses" like travel, vacation and social activities or discretionary items such as cars, recreational vehicles, second homes and other consumer goods. Categorize your "wishes" as gifts you would like to make to friends, family or even charity. By allotting your finances in these three categories, you'll have a better idea of how to budget for retirement. 2. Estimate how long your personal savings may need to last. Thinking about how long your money will last in retirement may not be the most fun part of financial planning, but it is a vital component. It helps you make informed decisions about when to start Social Security, pension payments, survivorship benefits and tapping personal savings. By creating a timeline, you can decide when to start different income streams and how you'll distribute your income across your retirement years. You also need to take into consideration how expenses may change. For instance, your "wants" bucket may shrink later in retirement as you spend more time relaxing at home rather than traveling the globe. 3. Understand your Social Security and Medicare options. Even though there isn't any wrong answer on when and how much to receive in Social Security income, there are different options you should consider so you can leverage these benefits to best suit your situation. 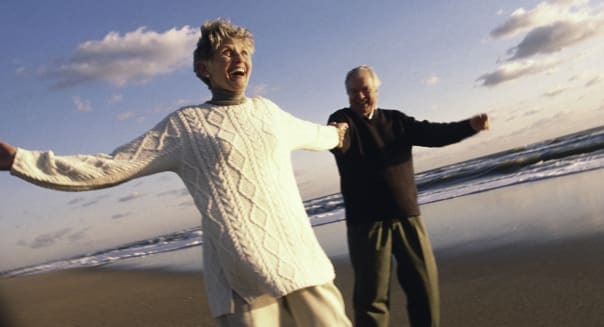 A July 2013 Voya Financial Retirement Experience study, which surveyed 2,442 adults over the age of 50 who were within five years of retirement or in retirement, found 78 percent of retirees started taking Social Security benefits before age 65, while 65 percent of them started benefits at age 62. Yet, if you plan to continue to work, anticipate a long retirement, or feel confident in your current savings, you probably want to wait to claim Social Security benefits until your full retirement age, which is between 66 and 67 years old, depending on your birth year. Delaying Social Security up until age 70 increases your benefit amount in retirement. Adding another wrinkle to your plan, if you are married, divorced or widowed, you have many options to consider based on how you file for benefits. Generally, a smart plan of action is to meet with your financial adviser, who can explain how different filing options impact your personal retirement goals. He or she can take into account life expectancy and anticipated income from savings. Through their professional experience and the use of planning software, financial advisers can indicate your probability of success when claiming retirement benefits. If you don't meet with an adviser, it is important to remember that although the Social Security Administration provides valuable educational resources, they are trained not to provide advice on timing and when it would be most opportune for you to begin collecting benefits. 4. Develop a strategy on how and when to withdraw money from your portfolio. Generating income during retirement is often one of preretirees' greatest concerns. Luckily, there are a few different approaches you can take to keep your mind at ease once you've stopped working. Your portfolio composition will vary based on the type of vehicle you are using and how you plan to spend your money. If you are looking for regular, predictable income, an annuity contract may be a good fit. An income-only strategy makes sense in a situation where you wish to only spend income generated by investment assets through dividends or interest income. A third strategy would aim to generate income and growth within your investments. This strategy helps you take "as needed" withdrawals to complement other primary and more predictable sources of income. The higher-risk portion of the portfolio is invested for the long term (greater than 10 years) for growth, while the lower risk portion is invested for the short term (less than 10 years) for income. This strategy generally poses more risk with your investments, but does have greater upside potential than the previous two strategies. To achieve your retirement income goals, the best strategy often ends up being a combination of these or other investment strategies -- delivering income strategically for your specific "needs," "wants" and "wishes." 5. Get help from a professional. Setting goals and making plans are all steps that you can take on your own, but a financial adviser will help ensure you've taken care of every detail. These tips will help get you started on your road to retirement readiness, but with the help of an adviser who can offer you ongoing advice and guidance, you will likely feel more confident about "needs," "wants" and "wishes" for a long and happy retirement. Tom Halloran is a blogger for The Smarter Investor. You can connect with him on LinkedIn, follow his company Voya Financial on Twitter or like it on Facebook. Eliminating your mortgage is one of the best ways to make retirement more affordable because it removes a sizable monthly bill. While you'll still have to pay taxes and maintenance costs for your home, those expenses are likely to be a fraction of your mortgage payments. Once your children are independent, you will likely no longer need a several-bedroom house in a good school district with a large yard that can be expensive to maintain. Consider downsizing to a smaller home in a less-expensive neighborhood, and add the proceeds of the sale to your nest egg. Where you live plays a big role in how much you pay for food, taxes and a variety of other services. Moving to an area where the cost of living is significantly less could allow you to spend down your retirement savings more slowly. If you and your spouse commuted to separate places each day, it is likely that you each needed a car. In retirement, you might be able to get by with one car, thus eliminating the insurance, gas and maintenance costs of the second vehicle. In walkable communities with good public transportation, you may even be able to get by without a car in retirement. In retirement, income tax will be due on withdrawals from traditional 401(k) and individual retirement accounts, but you can space out your withdrawals to avoid a hefty tax bill in a single year. Prepaying income tax on some of your retirement savings using a Roth IRA or Roth 401(k) allows you to avoid a big tax bill in retirement. Investing in high-cost funds reduces your return. Minimizing investment costs is especially important for retirees who are living off income from their portfolio. In this case, selecting the lowest-cost funds that meet your investment needs translates to more money in your pocket. There are significant penalties if you withdraw money from your retirement account too soon or too late. There is also a reduction in benefits if you sign up for Social Security early, and a late enrollment penalty if you delay signing up for Medicare Parts B and D. Pay attention to important retirement deadlines to avoid paying more than you need to. Health care is likely to be one of the biggest and least predictable costs you will face in retirement. But there are some things you can do to control your health costs. Consider purchasing a supplemental policy to Medicare to fill in some of the gaps and cost-sharing requirements traditional Medicare doesn't cover. Also, shop for a new Medicare Part D plan every year to make sure you are getting coverage for your medications at the best price. Retirees have the luxury of being able to travel whenever they want. Traveling is often less expensive if you avoid major holidays and school breaks, and most tourist destinations will also be less crowded. One of the major perks of growing older is getting discounts at movies, museums and restaurants. While some senior discounts are well-publicized and open to everyone old enough to have an AARP card, others are available only to those who ask. A little research can add up to big savings if you’re willing to admit your age.